Insperity, Inc. (NSP), a leading provider of human resources and business performance solutions for America’s best businesses, today announced a strategic alliance with the Club Managers Association of America (CMAA), the professional association for managers of membership clubs. Under the terms of the agreement, Insperity is designated as The Official HR Solutions Provider of CMAA. The membership club industry is an ideal fit for Insperity to offer its core Workforce Optimization® solution, which includes health care reform support, administrative relief and Fortune-100 level employee benefits. This solution enables club managers to spend less time focused on the administrative aspects of the club and more time to enhance the membership experience. For more information about the strategic alliance between Insperity and CMAA, visit http://www.insperity.com/cmaa. The Club Managers Association of America is the professional Association for managers of membership clubs. CMAA has close to 6,500 members across all classifications. Manager members operate more than 2,500 country, golf, city, athletic, faculty, yacht, town and military clubs. The objectives of the Association are to promote and advance friendly relations among persons connected with the management of clubs and other associations of similar character; to encourage the education and advancement of members; and to assist club officers and members, through their managers, to secure the utmost in efficient and successful operations. Insperity, a trusted advisor to America’s best businesses for more than 27 years, provides an array of human resources and business solutions designed to help improve business performance. Insperity® Business Performance Advisors offer the most comprehensive suite of products and services available in the marketplace. Insperity delivers administrative relief, better benefits, reduced liabilities and a systematic way to improve productivity through its premier Workforce Optimization® solution. Additional company offerings include Human Capital Management, Payroll Services, Time and Attendance, Performance Management, Organizational Planning, Recruiting Services, Employment Screening, Financial Services, Expense Management, Retirement Services and Insurance Services. Insperity business performance solutions support more than 100,000 businesses with over 2 million employees. With 2012 revenues of $2.2 billion, Insperity operates in 57 offices throughout the United States. For more information, visit http://www.insperity.com. variety of sources, mimics an investment bank these days. 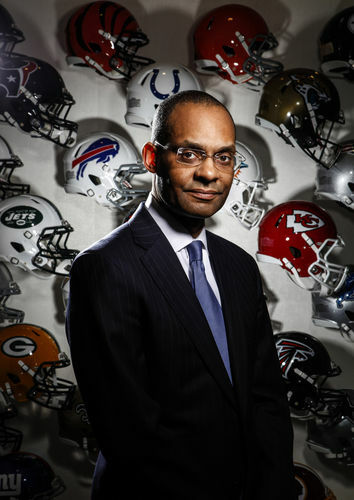 Robert Gulliver, executive vice president and chief human resources officer of the National Football League, stands for a photograph at the NFL offices in New York, on Jan. 27, 2014.
ventures and a former Goldman Sachs investment banker. accused of bullying a teammate who left the club. matters more than black or white. and General Electric Capital Corp.
way to make it to the NFL,” Gulliver said. for sports at the executive search firm Korn Ferry. and yesterday’s victory means nothing tomorrow,” he said. billion in annual revenue by 2027.